IMAGES (1) Top: The Spanish and other Europeans in the Americas learned the technology of panning for gold from the Taínos of Hispañola. [Drawing by Gonzalo Fernández de Oviedo y Valdéz of Taínos in the Caribbean’s Queskeya or Haiti Bohio (Hispañola) mining and panning gold in a river. From Historia general y natural de las indias, 1539-1548]. The Spanish brought the indigenous Caribbean technology to North America where independent prospectors still use it to find gold nuggets. (2) Bottom left: European royalty quickly enhanced their wealth with Caribbean-derived riches. [A painting of Queen Mary, by Flemish artist Hans Eworth.] In the painting, the monarch is wearing a giant pearl - known as La Peregrina - which was bought by actor Richard Burton for actress Elizabeth Taylor, 400 years later. It is one of the world’s largest and most perfectly shaped pearls, named La Peregrina (‘The Wanderer’), since an enslaved Native American pearl diver found it outside of its shell. As a reward, he was given his freedom. Father Bartolomé de las Casas, the “Defender of the Indians” railed against the cruelty and resulting devastation of Lucayan Taíno population due to the use of many conch divers exploited as enslaved pearl divers off the deeper, cooler coastal waters off Venezuela’s Margarita Island. As “the people who welcomed Columbus”, he described that they had now “looked like deformed dogs suffering from the bends and covered with sores that would not heal.” He recommended the use of enslaved Spanish-speaking Africans in Spain (called Ladinos) as a means of saving the remnants of surviving Amerindian populations. This resulted in the second round of European slavery in the Americas¬ the African slave trade. The first Spanish sailors to arrive off the Caribbean coast of Venezuela encountered an ancient trade in pearls. At its height, the Caribbean pearl trade dominated the traditional market in the Middle East. Although Margarita Island still sells Caribbean pearls, overfishing of oysters and Japanese development of cultured pearls contributed to the end of this dominance. (3) Bottom center: A contemporary beneficiary of indigenous American enslavement. [A photo of actress Elizabeth Taylor wearing La Perigina]. In 1969, Richard Burton bought it as a present for her in New York. She once temporarily lost the pearl that she later found in her dog’s mouth. 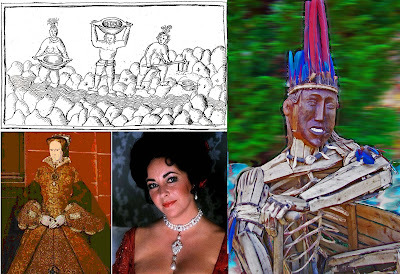 (4) Right: Digitally enhanced sculpture with a mask-like face of the Taíno epic hero Guahayona in his canoe, by Michael Auld. Should we celebrate Columbus or Thanksgiving Day? What does Columbus Day mean to Native Americans? The Columbus holy day is now over. Most Americans are now looking forward to another controversial celebration to Native Americans, Thanksgiving Day. Are these holy days times for rejoicing by everyone? The answer depends on with whom you identify. Since both of the above holy days are peculiar to North America, we should examine alternative points of view. DENVER -- With signs reading "Don't Celebrate Genocide," "Don't Celebrate Racism," and "The Americas' First Terrorist," the preview to the annual Columbus Day parade seemed to have the same passion that lead to conflicts in previous years. On October 13, both The United States and Canada publicly celebrated a very holy day. In the USA, this holiday for bargains and sales was rightly a day for commercialism. In Canada, October 13th was Thanksgiving Day. Not all indigenous Americans think of these governmental set-aside times as holy days. On the contrary, to indigenous Americans these are dates for mourning the gigantic and unnecessary loss of life, homeland, culture, language, and wealth. “Since 1970, a growing group of Native Americans and their supporters have gathered on Thanksgiving Day in Plymouth, Mass., at the top of Cole's Hill, overlooking Plymouth Rock, for the ‘National Day of Mourning’ protest.” On Columbus Day, the Sons of Italy have parades in honor of their “heroic” homeboy. For example, last year in Long Island, New York “The 2007 Sons of Italy Columbus Day Parade, held in conjunction with the Town of Huntington’s Annual Long Island Fall Festival in the town of Huntington on Sunday October 7th 2007 at 1 p.m. was the largest of its kind in the Northeast.”—Sons of Italy Long Island’s Constantino Brumindi Lodge. “The Columbus Day Parade has been a tradition in New York since 1929 and takes place every year on the first Monday of October. The parade celebrates the friendship between Italy and the USA, as well as the mutual respect and cooperation between the two countries.” One person’s saint is another person’s demon. What were the goals of Christopher Columbus? Who benefitted most from his 1492 voyage to the sun-fun and white sandy beaches of the Bahamas? From his writings, utmost in his mind on that fateful October 11th day were royal titles, land and financial enrichment from lucrative spice trade, gold and the enslavement of indigenous American populations. “Guahayona departed with all the women and went in search of other lands, and he arrived in Matinino [meaning, “Without Fathers”], where he immediately left the women and went to another region, called Guanin [meaning, “14k Gold”).” Chapter IV, An Account of the Antiquities of the Indians, by Fray Ramón Pané (from the long-lost original manuscript and via Columbus’s son Ferdinand who included it in the biography he wrote in defense of his then disgraced father). Pané gathered this intelligence from the Taíno cacique (chief) Guarionex’s (Gwa-ree-own-nay) territory between spring 1495 and the end of 1496. The above tale recorded by Father Pané on Hispañola “by order of the illustrious Lord Admiral and Viceroy and Governor of the Islands and Mainland of the Indies” (i.e. Christopher Columbus) unwittingly led to the ravenous search for gold and the wanton destruction of thousands of indigenous communities in the Americas. After 500 years, these communities are still suffering from selfish European profit and continued misbehavior in the Americas. Amazon n 1. Mythological Warriors in Greek mythology, members of a group of women warriors who lived in Scythia or elsewhere in the northern limits of the world. 2. River a river in South America. 3 the world’s second longest river (About 4,000 mi/6,400 km). Named by the Spanish after “one of Gonzalo Pizarro's [whose brother had just conquered the Inca empire] lieutenants, Francisco de Orellana, during his 1541 expedition, east of Quito into the South American interior in search of El Dorado and the Country of the Cinnamon [who] was ordered to explore the Coca River and return when the river ended. He finally arrived to the Amazon River, and so named it because they were attacked by fierce female warriors like the mythological Amazons.” Amazon River, Wikipedia, the Free Encyclopedia. California, n the U.S. state thought by some to be named after Queen Califia a legendary *black Amazon warrior queen, associated with the mythical Island of La California. 1 from the most popular 16th century Spanish novel Las sergas de Esplandián (The Adventures of Esplandián), written around 1510 by the Spanish writer Garci Rodríguez de Montalvo. 2 believed to have been derived from the Taíno epic myth of Guahayona that combined his travels to Matinino and Guanin. Like Guahayona, Esplandián traveled to an isle of women and gold in the Indies. After conquering the Mexica (Aztec) in 1619, Hernán Cortés saw the California Mountains from Baja California and believed it to be the fabled steep-sided “La California”. * “black” does not necessarily mean African. As with the Chinese and Indians in England today, the color was used to designate anyone not “white”. ** The idyllic Caribbean. El Dorado, n (Spanish for "the golden one") 1. is a legend that began with the story of a South American tribal chief who covered himself with gold dust and would dive into a lake of pure mountain water. The legend began in the 1530s, in the Andes of present-day Colombia, where conquistador Gonzalo Jiménez de Quesada first found the gold rich Muisca, a nation in the modern day Cundinamarca and Boyacá highlands of Colombia, in 1537. According to contemporary Spanish beliefs based on the Guahayona tale, when one found Amazons gold was not far behind. Ironically, both in California and South America Europeans did find gold after seeing the abode of “Amazons”. Should indigenous Americans celebrate their demise? Although Powhatan, “Pueblo, Cherokee, Creek and many other indigenous American societies organized thanksgiving harvest festivals with ceremonial dances and other celebrations centuries before the arrival of the first Europeans in the Americas”, their reason for giving thanks to the Supreme Being did not include the underlying reality of the unbridled destruction of a people through ethnic cleansing. Celebrating Columbus and Thanksgiving Days…I don’t think so!